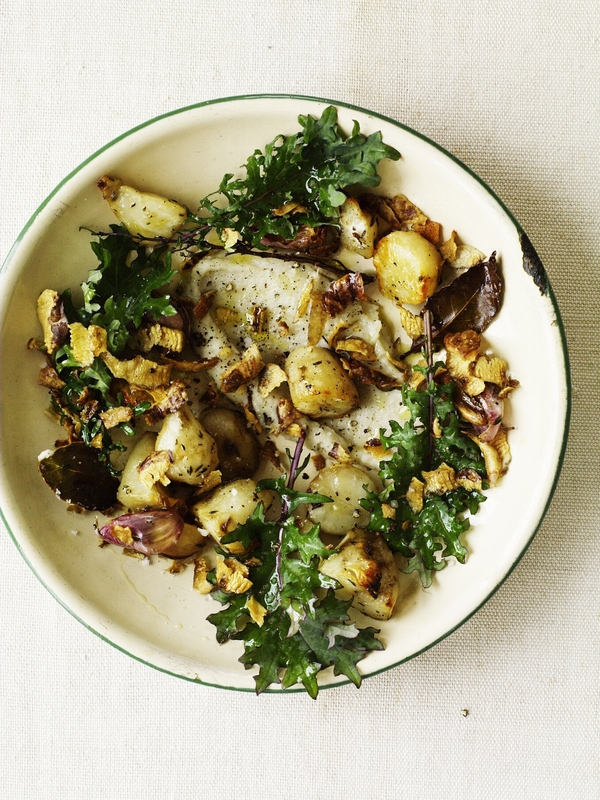 This dish makes the most of Jerusalem artichokes; they’re such a versatile ingredient. I love their rich, deep earthy flavour when roasted. They become tender in the middle but retain a sugary, caramelised chew. The clean green flavour of raw kale is often underestimated. If picked young it makes a wonderful salad leaf and really is perfect with artichokes. Peel the artichokes but reserve the skins. These get deep-fried and are absolutely delicious. Cut the peeled artichokes into smallish pieces, roughly 3cm sq. Place the artichokes into a large roasting tin along with the cloves of garlic, bay leaves, thyme and a generous trickle of olive oil. Season the artichokes all over with salt and pepper then place in the oven to roast. Cook, stirring once or twice, for 1 – 1.1/4 hours or until tender and caramelised. Take a third of the artichokes and place them in the jug or a food blender with the butter and just enough water to loosen them so they puree down to a smooth spoonable texture. Check the puree seasoning and keep warm. Give the artichoke skins a good wash in fresh water, drain and pat dry in a clean tea towel, as it’s important they aren’t wet when they get fried. Heat 2 – 3 cm of oil in a medium sized saucepan when hot (170.c) fry the artichoke skin in batches. They take about 2 – 3 minutes. Don’t let them get to dark or they will be bitter. Remove each batch of artichokes to absorbent paper the season them all with good pinch of salt. Place the kale leaves in a bowl and dress lightly with a squeeze of lemon juice. To serve divide the puree between 4 warm plates. Dot around the roasted artichoke pieces, giving each person a couple of cloves of garlic as well. Scatter over the lemony kale leaves. Finish with a sprinkling of crispy artichoke skins and a light trickle of your best olive oil.